Generally known today as Honduras Mahogany, this tropical hardwood is indigenous to South America, Central America and Africa. There are many different grades and species sold under this name and they vary widely in quality and price. Mahogany which comes from the Caribbean is generally thought of as the hardest, strongest and best quality. Logs from Africa are highly figured, but of lesser quality. 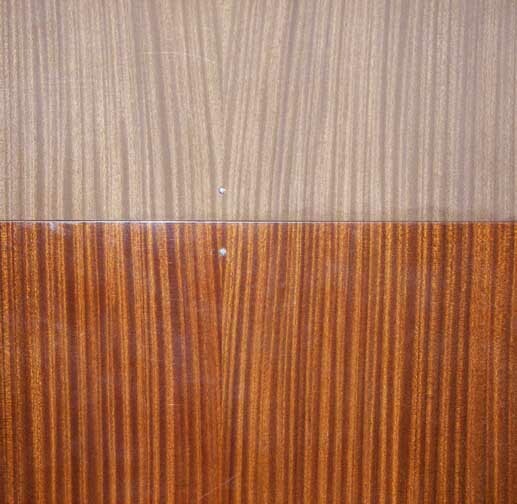 Mahogany from the Philippines has a similar color to mahogany, but is not as strong, durable or beautiful when finished. In fact, Philippine mahogany is not really mahogany at all but a lesser wood. In the 21st century, Honduran mahogany is generally used by fine furniture manufacturers, such as the Kittinger Company in Buffalo, NY. Mahogany was known in Europe since the time of the Spanish explorers, but it was not widely used for furniture before the 18th century, when it largely replaced walnut as the predominant cabinet making wood. It was at this time that English Georgian cabinetmakers such as Chippendale and Sheraton, and Americans like Goddard and Townsend used it extensively. Empire, Federal and Victorian craftsmen also enjoyed using this wood. By 1750 mahogany had supplanted walnut for the highest quality work in England, and about the same time it became important in America. In the American past, a mahogany log, to be used to make a piece of furniture, was sometimes given as a present. Flame / Crotch - The part of the tree from which the limbs and branches develop. It always produces a highly figured V-grain of an extremely decorative character. Reproduction secretary breakfront - Kittinger Furniture Co.
Crotch mahogany - Reproduction Hepplewhite style commode - Kittinger Furniture Co.
Honduran mahogany 1/32" thick veneer sheets - Kittinger Furniture Co.
Hofmobiliendepot Imperial Furniture Collection,Vienna, Austria. On display in 2005.